You are at:Home»Living»Top 10 Best Electric Lawn Trimmers On The Market. Top 10 Best Electric Lawn Trimmers On The Market. Are you looking for an electric lawn trimmer to get rid of the terrible weed and grass in your yard? Well, this article helps you maintain and give your garden that professional look through reviews of the top ten best lawn trimmers considering their designs, performance and even power levels. These electric trimmers are well designed to be environmentally friendly as they emit fewer fumes and have reduced noise and vibration. With the push of a button and everything set, these machines never disappoint as they are convenient and reliable to perform extended cutting tasks. What To Look For In Electric Trimmers. Before buying any trimmer in the market, you need to consider various factors such as the design, string, power options and even warranty. This helps you spend your money for the right product that will last. The following factors will help you choose the right string trimmer for your yard. • Design – a good trimmer should be lightweight to enable the user to carry it from one point to another. Other features such as adjustable shaft and handle that enhances comfort need to be considered. It should also have a safety design such as metal guards and protected starter switch that protects the user during its usage. • Power options and battery – this is one crucial feature that you need to consider before laying your hand on any lawn trimmer. In this review, we found trimmers with high amps and battery capacity for the corded and cordless lawn trimmers respectively. One needs a great power to efficiently trim persistent weeds and therefore the need for a safe and reliable source of energy that can accomplish your trimming tasks without pausing halfway. Corded trimmers enable you to trim for long hours without worrying about the need to recharge the battery though limits your movement. However, for large lawns or yard spaces, cordless trimmers are the best since you have limitless mobility. • String features – you should buy an electric trimmer with an easy to replace string and automatic feed system. For high cutting power, an extra line head is more convenient when cutting tough and long weed. Another important feature to check out is an extra wide cutting path that enables you to trim faster and access tight and narrow areas. 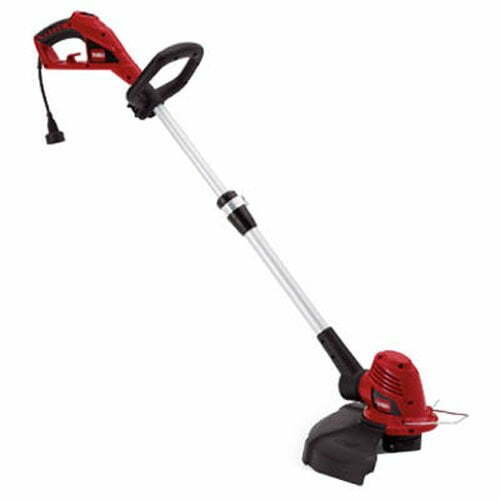 • Price – price varies whether the trimmer is cordless or corded. Cordless trimmers are more expensive than the corded ones due to the extra expense of battery and charger. Before buying, you need to check if the trimmer comes with an extra charger and battery and if it is economical. You need to confirm if the battery and charger are in the tool price and its compatibility with other devices. • Warranty and support – most trimmers in the industry have a two-year warranty that lets the manufacturer cover for the defects in parts or poor assembly to boost user’s confidence. Most of the trimmers in this review met this standard. Manufacturer support includes a provision of repair locations and device support through websites. Reviews Of The Best Electric Lawn Trimmers. 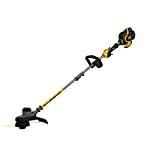 Below are more information on some of the best electric lawn trimmers, but you can click the link of each product to get an update on the current price and customer reviews on Amazon. Awarded as the best electric lawn trimmer is Decker LST136W. 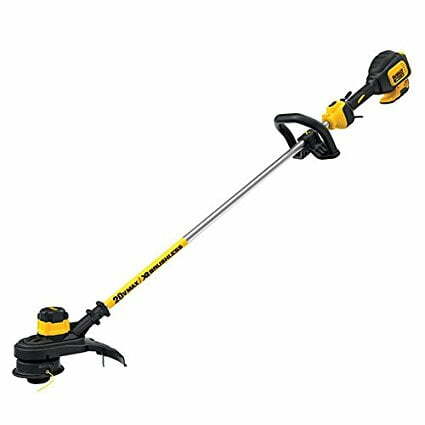 From its high reviews in most stores, this cordless string trimmer enables you to perform the most severe trimming tasks. With its PowerDrive Transmission design, you are able to choose the amount of power required to perform your task. This trimmer has additional features such as 13-inch cutting width that enables you to trim a wide area. Its head can be tilted through 180 degrees for quick switches from cutting to edging works. This allows the machine to perform the trimming and cutting tasks, twice as other electric trimmers available. Powered by a 40-volt battery, Decker LST136W has a longer runtime with a prolonged battery life. With a faster charger, you can charge in an hour and resume your trimming activities making it convenient. • Adjustable power output level that increases performance. • Automatic feed spool for continuous trimming tasks. • Previous users complain of short battery runtime. • Has a terrible auto-feed mechanism that jams and overfeeds. Decker LST136W is one of the best cordless in the trimmer that is powerful enough to cut through you tall grass and weed. With its amazing features, you can cover a large area with wide cutting path to make your trimming tasks easier. GreenWorks 21212 string trimmers are one of the environment-friendly electric lawn trimmers that have zero carbon footprint. It is one of the quality power tools for your garden that is reliable and have a high level of performance. With a unique design, this machine weighs only 5.2 lbs making it lightweight and easy to use. Starting the machine is simple as it is electric, making it hassle free and even more convenient to use. These products are available in users’ choice depending on the size of your yard. GreenWorks 21212 comes with a four-year warranty, double the industry standard, allowing inconveniences in any case of defective parts or poor assembly by the manufacturer. It is worth spending your money on as quality is guaranteed. • Environmentally friendly due to the reduced emissions. • Lightweight, making it easy to use around any landscape and vegetation surface. • Short adjustable shaft, making it hard for tall people to use. • Parts for replacements are not easily available in stores. Ryobi P2006 18V String Trimmer has an ergonomic design which helps you perform your edging and trimming tasks with a lot of ease. The three positioning trimmer head allows you to cut grass or weed in any terrain. This product is known to be a modification of the previous Ryobi electric trimmers. This device comes with an edge guard ensuring the trimmer is in good position making it work better compared to those trimmers with wheels. Its flexible shaft provides comfort for people of different heights, enabling you to weed at the best angle. 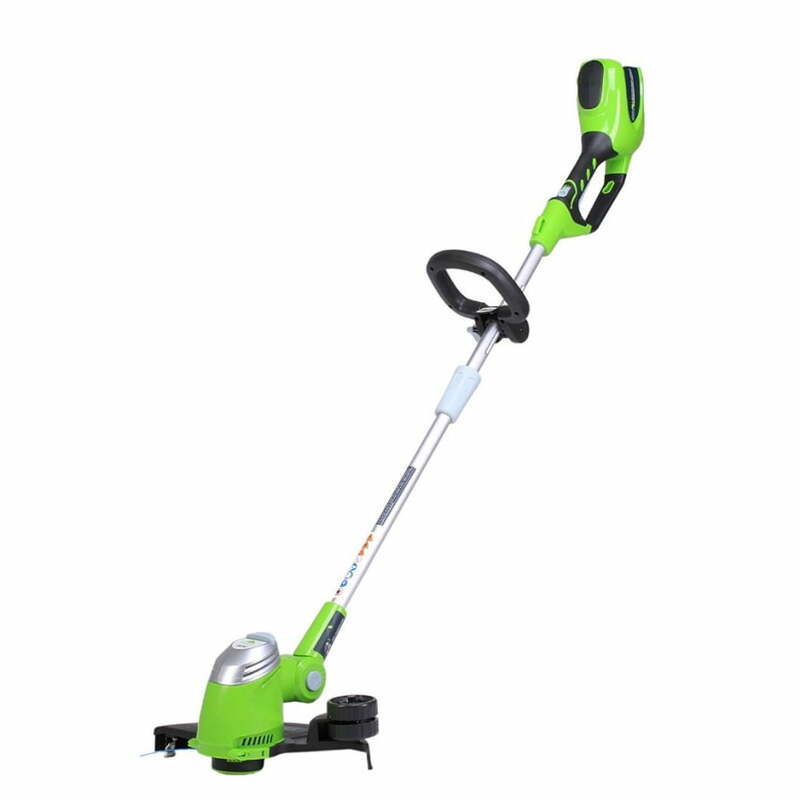 Although the 18-volt battery performs the trimming tasks pretty well, it is on the low end as compared to most cordless lawn trimmers in the market that have a 40-volt battery. Its battery capacity does not compromise its power as it can perform with a small difference. • Easily adjusts to the required height for trimming and edging lengths. • Good grip on the handle that provides comfort for extended trimming hours. • Has a versatile three-position cutting head and an auto feed line head that has no bumping. • An 18-volt battery that is below the standard average. • Thin string for the auto feed function. 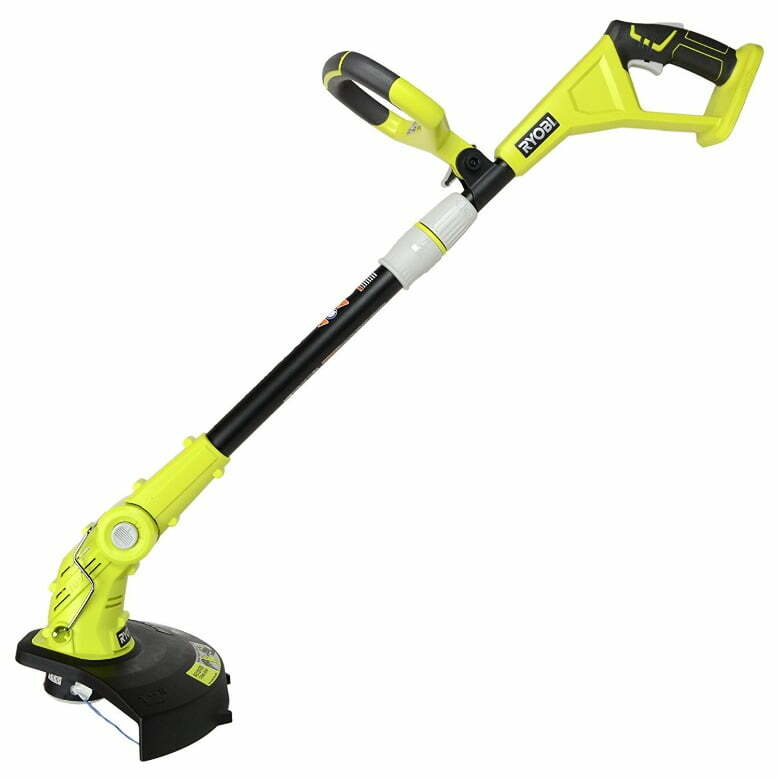 Ryobi is an excellent trimmer that helps you maintain a good look of your yard for years. With its unique design and incredible features such as the adjustable cutting width and shaft, it provides the comfort you need to trim, weed and edge your lawn. 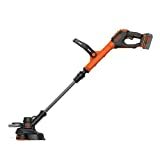 BLACK+DECKER GH900 String Trimmer/Edger, is one of the affordable string trimmers that have unique features worth giving a try. Known to be lightweight yet powerful, this device can get rid of different weed and grass condition in your lawn. Its 6.5 amp motor provides high torque transmission that can perform a wide variety of your trimming tasks. It also has a lightweight design with an adjustable handle that gives the comfort you need in trimming and edging. Although this device has users’ complaints on terrible feeding line that dashes, it is advisable to store additional spools of line in a plastic bag with a tablespoon of water that will keep the line from drying out. • Ergonomic design with adjustable height and pivoting handle. • Pathetic automatic feed system. • Runs slower when switched to the edging configuration. • A 2-year warranty which is average for most electric weed eaters. 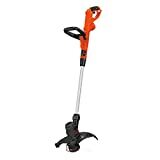 BLACK+DECKER GH900 String Trimmer comes at an affordable price with the ability cut various weed and grass conditions. With its wide cutting path and wheels, you are able to perform trimming tasks faster than you ever expected. 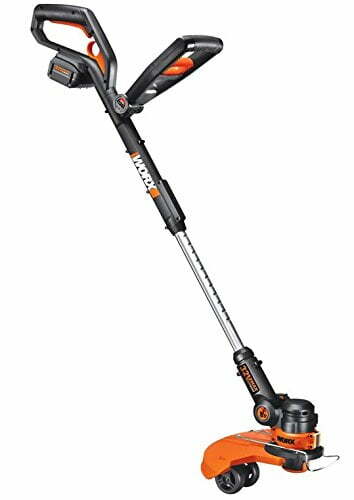 With a 40-volt battery, WORX WG168 40-volt Lithium Cordless Grass Trimmer and Edger has a variable speed control that enables you to trim various grass condition with much ease. This electric trimmer can adjust to three different speeds, generating high trimming power. It comes with an edge guard that helps in keeping track of the lawn edge and protecting other plants from damage during the trimming tasks. Its cordless design makes it easier to handle without having to use an extension cord. This device is easy to assemble in few minutes and comes with a 20-foot string that is easy to replace when worn out. Manufacturers provide a 3-year warranty that takes into consideration of the inconveniences during use or poor craftsmanship. • Long lasting and a lightweight 40-volt battery that has no self-discharging. • Adjustable handle provides comfort and good balance. • Unique design that controls speed to maximize run time and trimming activities. • The metal guide enables quick and fast edging. • A small cutting diameter of 13-inches. • Difficulty in charging the battery that doesn’t hold the charge. 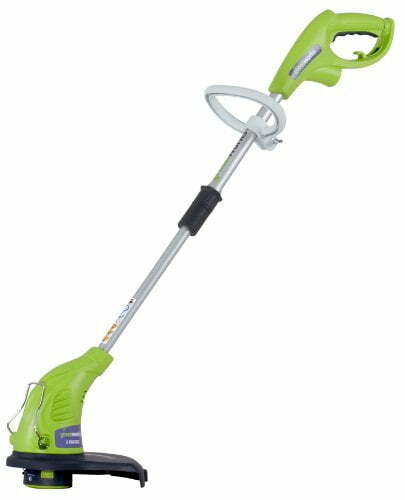 The cordless Worx machine runs pretty well compared to other lawn trimmers. It is one versatile device that is easy to handle and replace parts. It comes with a 20-foot spool among other amazing features that will help you maintain the looks in your yard. Affordable yet highly functional, Toro 51480 Electric Trimmer/Edger comes with a powerful 5 amp motor that effortlessly trims your tall grass and weed. It has high-performing features that help you improve the look of your yard in seconds. It has an extended shaft that makes trimming tasks comfortable to different heights of people. The tilting heads enable you to have detailed trimming and edging. However, its auto feed mechanism doesn’t work making you remove so as to adjust the line manually. With lots of support options and a two-year warranty, Toro electric trimmer is easy to operate and handle making it more versatile. Lasting power options that save on battery levels to give a long runtime that enables you to carry out your trimming tasks adequately. • Adjustable trimmer shaft that provides an extended reach for all heights. • Wide 14-inch cutting head that enables you to perform your tasks faster. • Adjustable handle that provides great balance and comfort. • High-quality power tool at an affordable price. • Terrible auto line feeds making trimming tasks time-consuming. • Heavier than most lawn trimmers hence tiring. • A two-year warranty that is below average for gardening tools available in the market. 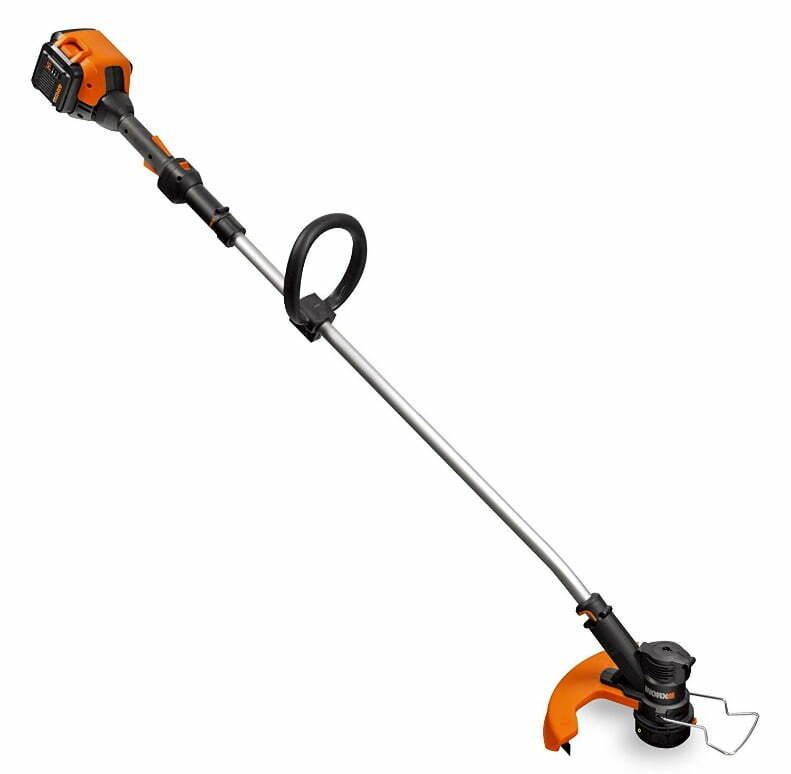 This corded electric lawn trimmer enables you to perform your trimming/edging tasks without worrying about power levels or recharging the battery. Its advantages outweigh the disadvantages making it a trimmer worth trying. At an affordable price, you will not be disappointed at the performance of this machine. DEWALT Brushless String Trimmer is another amazing machine that has power control with variable speed control trigger. Its brushless engine provides higher efficiency and durability, giving it more run time. Dewalt has a patented gear drive design with power control options giving it a greater drive force compared to other engines. Its engine can last up to three years giving it an expanded life range. With its high and low power options, you can adjust to the performance of your choice. • Durable and high efficient brushless engine. • Interchangeable batteries that can be used with other tools. • Patented gear drive design. • Speed control and variable trigger. • Previous users complain of the motor wearing out. • Trimmer guard is not good for trimming and edging tasks. • Cannot easily rotate for edging. Dewalt is a well-known brand name for their well-performing tools in the manufacturing and maintenance categories. Their machines have several advantages from having good balance, light weight and excellent grip for reduced vibrations. They have the best motor designs to help your trim your yard. 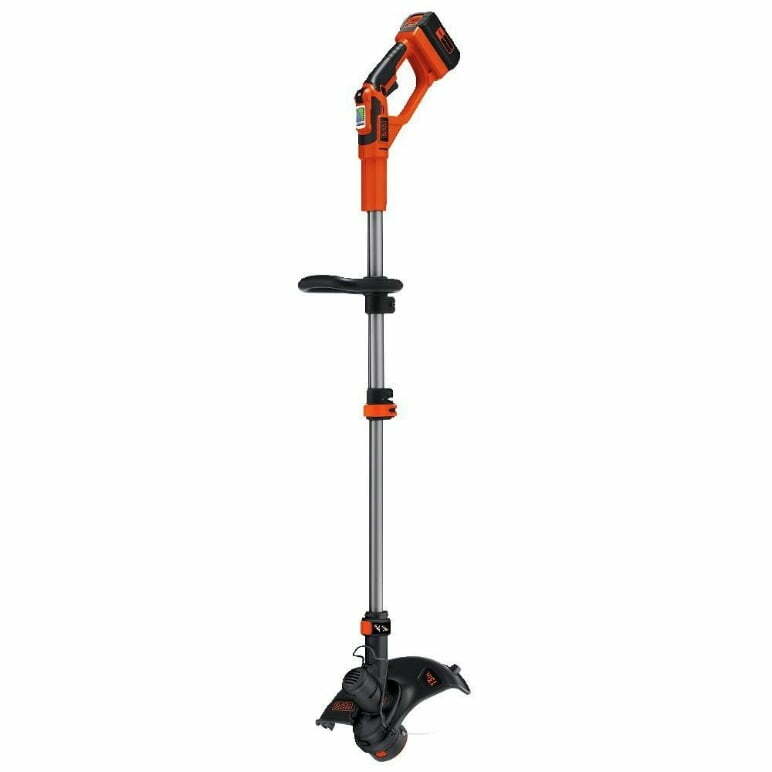 Worx grass trimmer is not only a common weed trimmer brand name in the market; it is one powerful machine with the best reviews for home garden tools. This power tool is not only a trimmer but also an edger and a mower with two wheels to enable it to maneuver. This tool can convert from a trimmer to an in-line edger without the use of other instruments. With its quick release lever, its height can be easily adjusted to enable you to perform the trimming tasks way much easier. Worx has easy to maneuver features such as the 90-degree tilting head and the 12-inch cutting diameter for a wide coverage. It also comes with a 32V MaxLithium battery that lasts for long, trimmer spools and a charger. • Movable support handle that is comfortable to use during the trimming tasks. • Multi-functional and can be utilized for various purposes. • Has no shoulder strap. • It has a short battery life. Worx is one of the top electric trimmers that can trim your lawn of a different kind of grass height due to its high level of performance. 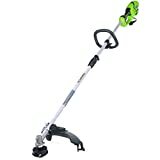 GreenWorks 21332 Cordless String Trimmer is another affordable yet powerful electric trimmer from Greenworks. With its 4 amp motor, it has some of the best features that can get rid of the annoying grass and weed. With this corded trimmer, you no longer have to worry about running out of power while performing your trimming tasks or recharging. The 13-inch cutting width provides a wide area to handle the cutting and trimming tasks. Another added benefit of this device is that it is user and environmentally friendly. Greenworks products are well known for their reduced carbon emissions and pollution to the environment. The manufacturer also gives a 4-year warranty for any inconveniences or machine failure. • Head quickly rotates for edging and trimming. • Light and easy to start making it more reliable. • Short adjustable shaft, hence difficult to use by tall people. • Weak auto feed system. GreenWorks 21332 is one of the most affordable electric trimmers with a variety of features making it versatile. With less noise, vibration and reduced emissions, it is safe for the environment. It is a machine worth trying that will never disappoint regarding performance. Although less known, Core cordless trimmers are designed to last and offer the best performance. This device has a dual mode power that enables you to control speed and save on the battery. For regular grass trimming, a recommended head speed of 7000rpm is fit while for persistent, tough weed, a head spin of 5000rpm is the best to give more torque. 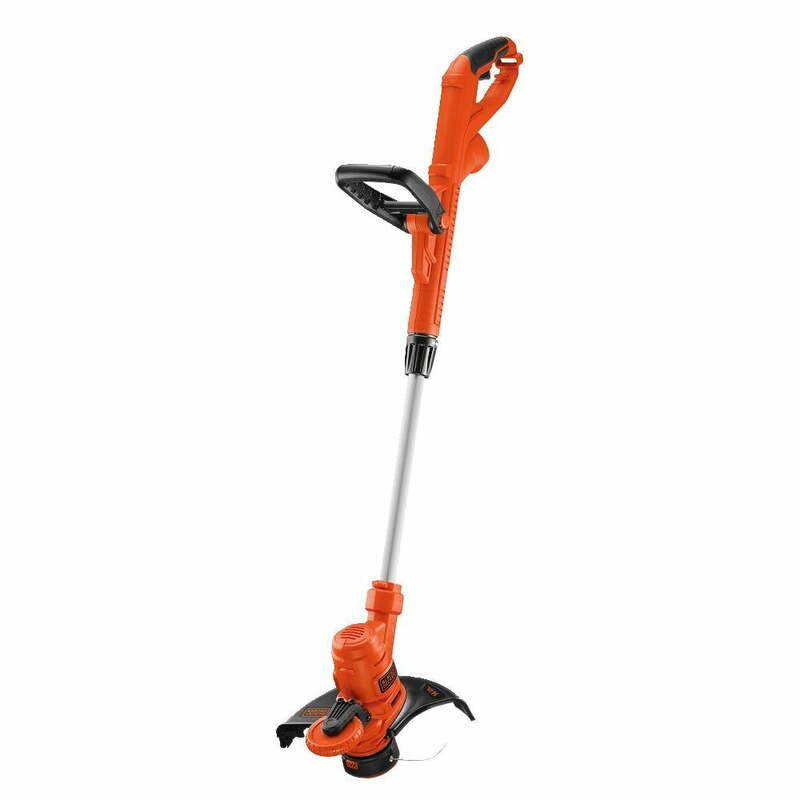 This lawn trimmer also enables you to trim large yard space with an outstanding power cell that has a runtime of up to 70 minutes. It also has a dual line head that enables you to feed in two different spools. The head is steady enough with a feed line of the standard method. CORE CGT400 CGTSD Trimmer comes with a 5-year warranty for home use and 2-year warranty for commercial purposes. You, therefore, don’t have to worry about damage to parts or poor craftsmanship. • Lightweight and easily portable. • The bump feature does not work well. • The battery does not last long enough. Perfectly designed with a good balance and incredible features such as dual power control options, guard and comfortable handle, this lightweight lawn trimmer performs similarly as the best trimmers in the market yet affordable and worth spending on. This review gives some of the best electric lawn trimmers that you should try today. Reviewed by their performance, functionality and even price, these machines are known to effectively get rid of tough and persistent weeds in your yard. 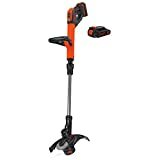 You can get whichever grass trimmer in this article that works best for you by checking the previous user’s comments on the Amazon links provided above. Feel free to share this information with friends and anyone else who might have difficulties in maintaining his yard.